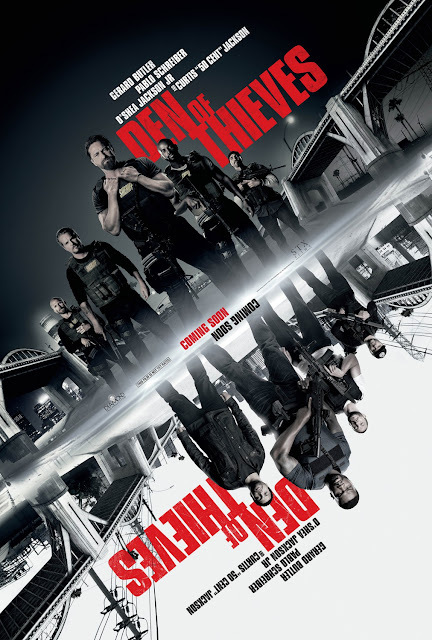 Chrichton's World: Review Den of Thieves (2018): Entertaining but it's not Heat by a long shot! Review Den of Thieves (2018): Entertaining but it's not Heat by a long shot! Den of Thieves surprised me by actually being consistently entertaining. It has some good performances and the action and crime elements are solid enough. However it is a very flawed film that tries to be Heat. Or even thinks it can surpass it by adding a twist that is so laughable that it completely detracts from the overall edgy tone the film had until the reveal. Let me start with the performances. They are so good that make you overlook the lack of plot and characterization. Gerard Butler is at his best when playing the hard boiled cop Big Nick who has screwed up most of his family life. We have to assume that he is too obsessed with his job like Vincent Hanna (Al Pacino) was in Heat. I say assume because apart from a scene or two this never gets discussed or pointed out. There is no real dialogue about how his job has gotten in the way. Because basically Nick is a jerk. A very big jerk. He cheats on his wife and then doesn't even has the decency to hide that he does. He accidentally had sent a text to his wife intended for a girlfriend. What kind of a man does that? I told you a big jerk. Ray Merrimen played by Pablo Schreiber is very much like Neil McCauley (Robert De Niro) in Heat. I really liked him in the role. But unfortunately he is not given much to work with. Actually we don't get to know any of the characters that well. With a runtime of two hours and twenty minutes you would at least expect to get to know the main characters a little better. I am wondering if director Christian Gudegast even understood what made Heat such a masterpiece. Despite the action and crime elements that film was all about the characters. You got to know them pretty well and you could understand and even respect where they were coming from. Both Vincent and Neil had their bad traits and good ones. You were shown scenes where the best and worst were displayed. In this film that is completely absent, And yet it's overly obvious that we are supposed to root for Pablo's character even if we don't know who he actually is. But you are also expected to side with Donnie Wilson (O'Shea Jackson Jr.). who to be fair does deserve our sympathy. The twist however puts a spin on both these characters that destroys their characters. No it's not clever Christian. When you add a twist that is so far fetched and idiotic where you ruin the characters then you have done the exact opposite. Especially if it has no impact whatsoever. That being said I never was bored with the film. The runtime could have been shorter for sure but seeing how I was entertained throughout it wasn't a big deal. What is unfortunate though that despite it's ambition it's hardly a memorable film. A one time watch only.